How to use R to extract data from WorldClim? I have a data set with 1000 different latitudes-longitudes. I wish to extract average annual temperature and annual precipitation for each of these coordinates. These data can easily be obtained from WorldClim and processed using DIVA-GIS. Is there anyway to do this on R? I want my final output to be a dataframe with the annual temperature and precipitation for each coordinate. I'm a newbie at GIS in R, so I seek a basic code chunk along with the required libraries for this output. You can use raster package to download WorldClim data, see ?getdata to know about resolution, variables and coordinates. I create random points as example, in your case use coordinates to create a SpatialPoint object. Finally, use extract. With cbind.data.frame and coordinates you will get the desire data.frame. I used random points, so I got a lot of NA. It is to be expected. Don't forget that WorldClim data has a scale factor of 10, so Temp = -37 is -3.7 ºC. Not the answer you're looking for? Browse other questions tagged r climate extract or ask your own question. Are there better climate data than Worldclim for Europe? Calculating Climate Suitable Days using netCDF4 and Python? 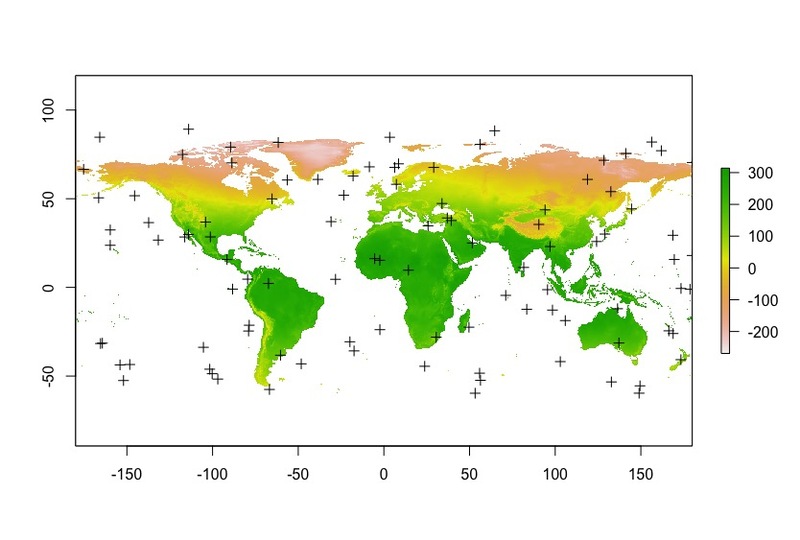 How to fetch polygons with top n highest temperature record in multi-layer raster data in R (with reproducible data)?